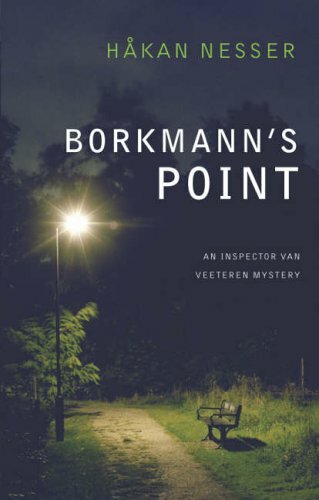 BORKMANN'S POINT is the second in the Inspector Van Veeteren series and the first to be available in English. It won the 'best novel' award from the Swedish Crime Writers' Academy in 1994. Though the author is Swedish he has chosen to set his books in a fictional country in Northern Europe with nouns and names derived from many languages including Swedish (presumably), Dutch, German and French. "My name is Inspector Kropke", said Kropke. "Funny first name" said the woman with a yawn. "But come in, even so". As well as the naive, technophile Kropke, there are two Constables, Bangs and Mooser. Van Veeteren brings his own man in, Munster, to assist and the plan is to find a link between the two victims. However they are no nearer a solution when a third person is killed and the weapon left behind. There's a hint of a link forming but the motivation for the killings is not clear to the police. The reader however, thanks to passages from the killer's point of view, knows the reason for the killings, at least vaguely at first and if they have their wits about them they'll know who's behind it all. I have to say that BORKMANN'S POINT was a bit of a disappointment. On the shortlist for The Duncan Lawrie International Dagger I was expecting something outstanding and different, as are some of the other entries. I enjoyed the ironical humour running through it but felt the plot wasn't very original and the whodunnit aspect quite transparent. Supporting cast members Moerk and Munster were more interesting than Van Veeteren and I'd like to see Moerk in another book. Van Veeteren is a smoker and drinker who loves fine food, classical music and chess and is able to solve a case through a flash of inspiration but in spite of knowing all this, I found it difficult to get a handle on him. Overall, this is a reasonable book, with an atmospheric sense of place, and it kept me interested, even though there were few surprises. The translation by Laurie Thompson, who also translates novels by Henning Mankell and Ake Edwardson, is this time rendered into US English. Read other reviews of BORKMANN'S POINT here and here.